The OT1000 Web Time Clock uses push technology to transmit web timesheet information to the On-Time Web servers automatically. The web time clock is easy to install. Just connect the power and the network cable, the unit will automatically contact our server to establish communication with the system. 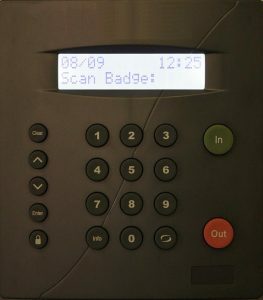 As employees clock in via RFID badges, the data is automatically transmitted to the server. Once the data is received, it is converted into web timesheet entries in the On-Time Web system. The OT1000 can also be used as remote web timesheet data collection devices. If you need to collect timesheet information at a job site or a location with no internet connection you can use a USB Pen Drive to receive the data from the unit. Just plug the drive into the USB port located on the bottom of the unit and the data is automatically transferred to the pen drive. The On-Time Web system contains a data import procedure that will copy the data from the pen drive and convert it into web timesheet data. If data needs to be retrieved due to data loss you can use the time clock retransmit data function to retransmit the data stored in the clock. The system administrator uses the clock setup form to specify a retransmit date, and at the next automatic transfer interval, the requested data is automatically sent to the On-Time Web system. Collect and manage data by utilizing the cloud! The OT1000™ is the first of its kind. A cloud-based time clock. The device collects data and automatically transmits to the web system for review and payment. A data review process is created for supervisors and management to review and approve data reducing costly errors, increasing efficiency, and compliance. Hassle Free Automatic System Updates are processed automatically from our central servers. As new updates for the OT1000™ are released, they are automatically applied to the unit without you having to monitor and implement them manually. Custom data collection scripts can be designed and applied automatically from our central servers. If you need additional customized data collection, a custom data collection script can be created and implemented while the OT1000™ remains in the field and. Scripts and system updates are applied automatically while the system remains functional in your environment. No costly maintenance contracts! Your monthly flat fee covers the use of the OT1000™, all maintenance, updates and unit replacements. Your OT1000™ is continuously monitored from your On-Time Web site to ensure it is online and functioning. The OT1000™ can be installed, implemented and up and running in hours, not days or months. Just connect the OT1000™ to your network and provide internet access and the OT1000™ will contact our central server and report in. Once the OT1000™ reports to the central server, it will be brought on-line and updated. You define the identifying information about your OT1000™, assign your RFID badges, and you are ready to use the system. For just $35.00 per month per clock, you receive the OT1000™ device, monitoring, maintenance, and upgrades. No more expensive hardware and maintenance fees!